When you operate a field service company, the word “efficiency” should sit at the top of your mind each and every day. When analyzing efficiency, you should look at your overall workflow from start to finish—as well as each individual step along the way—and constantly ask yourself one question; can you make any improvements? For example, how you handle dispatch represents a crucial point that can make or break how efficiently your company operates. This article will give you some tips for improving your dispatch operations and reaping the benefits. Why should you even care about efficiency? Wondering why efficiency is such an ever-present buzzword? Business gurus throw it around constantly, usually alongside “productivity.” But does it truly matter? Efficiency boils down to the adage “time is money.” If you want to spend your time wisely and get paid fairly, then you’ll prioritize efficiency and productivity. Efficiency allows you to increase your hourly profit by making sure you can get work done faster while also avoiding unnecessary expenses. This doesn’t mean you can simply move at a faster pace and call it “productivity.” For field technicians, this can lead to unsafe situations, not to mention undue stress. Instead, turn to technology. Technology represents a huge asset for efficiency. 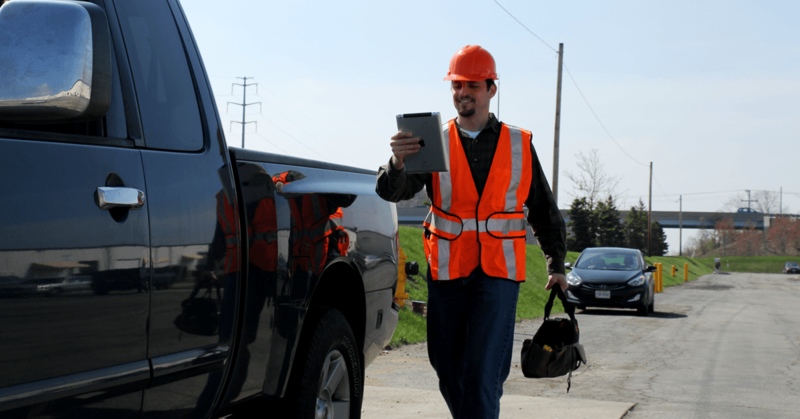 Apps and software related to dispatch and routing can help improve efficiency and your bottom line. If you’re satisfied with the amount of work you do for the profit you get, then don’t worry about improving efficiency. But if you’ve ever felt frustrated about the time you wasted driving back and forth across town for each job, then routing and dispatch tools could prove very useful. What makes a route efficient? Finding the shortest routes. Obviously, the most direct route from Point A to Point B will use less gasoline. But this is only the first piece of the pie, because traffic and other factors can make a direct route inefficient. Avoiding traffic-heavy areas. Some roads consistently get congested with traffic, especially at certain times of the day. You could end up sitting behind the wheel, wasting gas and falling behind schedule. Your customers typically don’t care why you arrive late, just that you arrived late, period. They want prompt service without delay, so do your best to avoid traffic. Scheduling stops based on location, not necessarily the time of the call. If you service a large area, either break it up into smaller areas for your technicians to travel in, or schedule your stops based on the location of each customer, even if the outlying customer called before one more conveniently located along your route. Choosing routes that allow for fuel-efficient driving. You can teach your technicians how to drive in a fuel-efficient way in order to save money on gasoline. However, routes with a lot of stop lights or stop signs require drivers to push on the gas pedal frequently. This directly translates to more fuel injected into the engine. Routes that keep the vehicle at a steady pace for as long as possible represent more fuel-efficient options. Finding the “perfect” route may prove impossible, but at least you can find a better route or confirm that you’re already traveling along the best one. As you can see from the list above, even minor changes can save on fuel costs. Of course, you won’t necessarily see the impact of these changes in your bank account right away. Over time though, the savings add up. Smart routing and dispatching allows you to potentially fit more customers in your schedule. Don’t go back and forth across town. Use technology to your advantage. Although you can use maps and GPS to figure out a route yourself, Artificial Intelligence (AI) has been developed to assist you. In the blink of an eye, AI-powered apps and software like Smart Service can help you make smart scheduling and routing decisions during dispatch. A gas price comparison app represents another helpful tool to add to your arsenal in terms of fuel efficiency. Gas prices can vary widely based on location. If your technicians are headed to an area with lower fuel costs, encourage them to top off the tank. The time for technicians to take notes with pen and paper has come and gone. With the right software, technicians can access all the customer and job information they need before they arrive to the job. Drop-down menus and other automated features make it easy for dispatchers to transmit this information accurately and efficiently. No matter how you slice it, technology boasts some impressive capabilities for increasing the efficiency of your fleet and the productivity of your entire team. Are you using it to its full potential?